This cream with extracts of elderberry flower, white water lily and lime flower moisturizes, softens and protects the skin while preventing the appearance of brown marks. Fleur's Delightful Body Exfoliating Mist is an exfoliaitng application for a fast, fresh, hydrating boost for the body. After lightly misting the floral water onto the body, smooth hands over the skin until absorbed for an ultra-soft, quenching finish for all skin types. 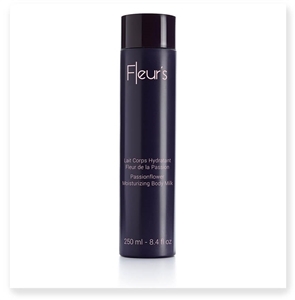 Fleur’s Passionflower Moisturizing Body Milk hydrates and nourishes the skin. This shimmery and pearlescent body milk has a refreshing white gardenia fragrance and rapidly absorbs into the skin. Designed to protect skin’s stem cells, this milk features Lifting Floral Bouquet, a blend of four rare flowers that act in synergy to firm the skin by stimulating collagen synthesis.